The Volvo C70 is a four-passenger two-door convertible. The first Volvo C70 was introduced in 1996 in Europe and in 1998 for the US marke ad a two-door coupe and a two-door soft-top convertible. This first generation car had a five cylinder turbocharged gas engine paired to either a manual and automatic transmission. The coupe disappeared from the market in 2003. The second generation C70 came out in 2006 with a three piece hardtop that retracted up and down in less than thirty seconds. At the time, the C70 received a ‘Top Safety Pick’ designation by the Insurance Institute for Highway Safety. The Volvo C70 comes in one trim only - the T5. It comes with a 2.5 L five-cylinder engine that produces 227 horsepower. It is paired to a six-speed manual gearbox or you can choose a five-speed Geartronic automatic transmission with manual shift control. According to Volvo, the C70 can go from zero to 60 mph in 7.0 seconds. It can reach a top speed of 150 miles an hour. One of the special features of this convertible is the retractable hard top system. It folds away into the trunk within thirty seconds. When folded down, the trunk space reduces from 12.8 cubic feet to 6.8 cubic feet. This hardtop offers a better noise barrier than conventional soft tops and offers a stiffer body giving better handling and better visibility. The interior of the vehicle has a contemporary look that is consistent with the classy looking exterior. The driver’s area has a cockpit design with a thin center stack. This easily allows for flow-through storage behind the controls. The seats are upholstered in Vulcaflex or if preferred, leather is an option. The Volvo C70, like most Volvo vehicles, comes fully loaded with popular features. Some of the most popular features are a six-disc CD changer with eight speakers and 160 watts, leather wrapped tilt and telescopic steering wheel, cruise control, trip computer, eight-way power front power seats with memory settings, front bucket seats with head restraint, and tire pressure monitoring gauge. For the exterior of the car there are tinted windows, power heated mirrors with memory and puddle lights, halogen headlights and even color keyed bumpers and body moldings for looks. On top of the many standard features, there are also several packages available. The Premium Packageoffers leather seating, a compass, and a remote garage door opener. There is a Climate Package, which offers heated front seats, headlamp washers and even rain-sensing windshield wipers. Another popular package is theConvenience Package.This one is new for 2008 and offers features like rear park assist, blind spot assistance with power retractable exterior and keyless drive. Options available as single features and not as a package include bi-xenon headlamps, 18-inch alloy wheels and a navigation system with DVD. Volvo has long had a high reputation for safety. This C70 is no exception. It offers four-wheel anti-lock braking system with emergency brake assistance, front passenger two stage airbags with passenger cut off sensors, Volvo’s Side Impact Protection System (SIPS), front, Overhead-mounted seat belt reminder lights, driver/front passenger whiplash protection system (WHIPS), rollover protection system (ROPS), dynamic stability and traction control (DSTC), anti-submarine seats, collapsible steering column and even daytime running lights. 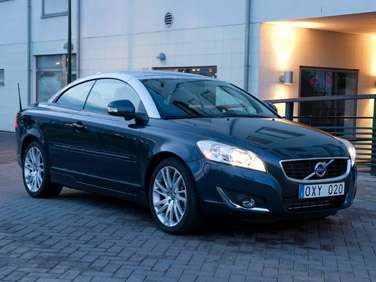 The 2009 Volvo C70 is a carryover from 2008. The 2009 C70 is sold in a single trim, the T5. Powering the hard top convertible is a 2.5 liter 5-cylinder engine that uses turbocharging in order to produce 227 horsepower and 236 lb-ft of torque. The motor turns in fuel mileage of 18 miles per gallon in the city and 27 miles per gallon on the highway. A 6-speed manual transmission is included free of charge, and buyers have the option of choosing a 5-speed automatic transmission featuring Geartronic shifting capability in its place.